KODAK EKTACHROME Professional Infrared EIR Film was an infrared-sensitive, “false-color” reversal film. It was intended for various photographic applications where infrared light may yield useful results, such as artistic, industrial, scientific, and aerial or technical ground photography. The amount of infrared reflectance present at any given time would affect the final color rendition. Kodak also sold it as an alternative stock: “Aerochrome III”, primarily designed for military or cartography purposes, in 120 film size. The film can be used to create striking artistic effects due to the false color response. Color rendition is dependent upon exposure, Processes E-6 or AR-5, and the amount of infrared reflectance of the subjects. Here are some examples taken by our friend David Hochleitner. Green leaves turn into vibrant red or intense magenta, blue water turns dark or even black, the clouds in the sky gain contrast. The reproduction is bizarre, yet beautiful. In Process E-6, flesh tone has a more sallow appearance with yellow lips (see the battle scene of Oliver Stone’s Alexander, shot in Aerochrome) which provides a unique look or special effect to the fashion or commercial photographer without software enhancement of the image. Filtration with different filters or combinations of filters can be used to extend the possibilities. With today’s film renaissance (sales are continuing to rise since the past 3 years), many film manufacturers are reviving older films which were previously discontinued, and with the announcement of Kodak’s re-release of Ektachrome in 2017, photographers worldwide are taking an interest into more analog processes for their image making. But the bad news is that KODAK discontinued the film nearly a decade ago and that it won’t come back. This is an almost-impossible-to-find film, if you are lucky, you may be able to grab one of the last frozen rolls that pop from time to time on online auctions websites. But be prepared to pay 80$ or more for only 24 exposures (and the material you’ll get has been expired for a long time)! There are many reasons that explain such a high price tag: the film has been discontinued years ago, it was the only infrared color slide film for E-6 processing available, it was made in small batches, it only last about a month out of the fridge and was an expensive film already in its time, about five times more than a regular roll. Since the beginning of IR digital photography, photographers have struggled to approach the same results, and there have been some noticeable successes. A lot of pioneers started using the same Yellow #12 filter that was used in IR color film photography. But the post-processing was kind of tedious and often required some advanced technical knowledge. Fine tuning the results was not easy. There was also a lot of fringing around small details like branches and leaves in the distance. JW Wong’s software is able to achieve a mathematically correct IRG-rendition from an image shot with a yellow filter. Since 2008 and more actively since 2015 I dove in the EIR digital emulation quest and tried a lot of unexplored methods. 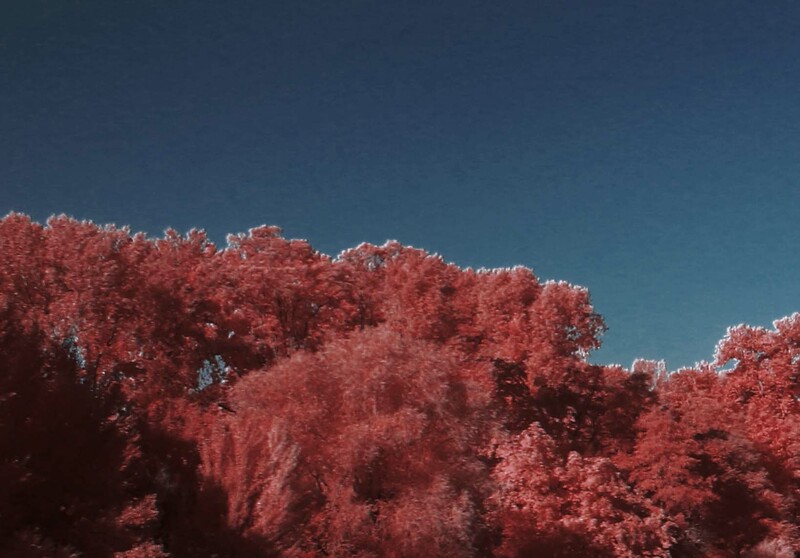 My goal was to obtain “in camera” color IR result without having to mix channels in post-production. I tried to go the other way round the color wheel using the complementary color of the yellow/orange filter (used in EIR photography): dark blueish cyan. Now available, you can have access to this all-new and exciting digital-IR render with a direct output of stunning vivid splashes of red on every IR-reflective material! It really revives Kodaks defunct classical and mythical film. I wondered if our final prototype was as close as we wanted it to be to the original EIR/Aerochrome film. So, I bought some remaining stock available on eBay for a jaw-dropping price tag of $60! Of course, these rolls expired a long time ago, so I had to remove a strong color cast when scanning in HD. Color charts comparison and older EIR Scans allowed me to come as close as possible to a non-expired reference. My workflow consisted in putting 2 cameras side by side on a rig: my digital Canon Eos 6D MKII converted by Kolari Vision and a Nikon F3 both equipped with a Super Multi-Coated Takumar 35mm 1:3.5. The digital camera was modified to full spectrum with the new IRChrome filter prototype, and the film camera had Aerochrome with either #12 (Yellow) or Orange filter. Pretty close, don’t you think ? Now, this rendering is at your fingertips! You can acquire the first filter ever made to be the best match to Kodak’s classic color infrared render without the need for huge Photoshopping alterations! Here are some of my shots taken with the IR Chrome filter prototype. Yann Philippe is a French photographer based in Paris. He is a teacher at Les Gobelins School, the owner of Flowim Studio, and a contributing author at Kolari Vision. He specializes in portrait and still life advertising, as well as infrared. You can see more of Yann’s work on his website, Facebook, and Instagram. This article was also published here and shared with permission. anyone knows good IR postprocessing tutorial?